Michigan has a regular cycle of seasons. 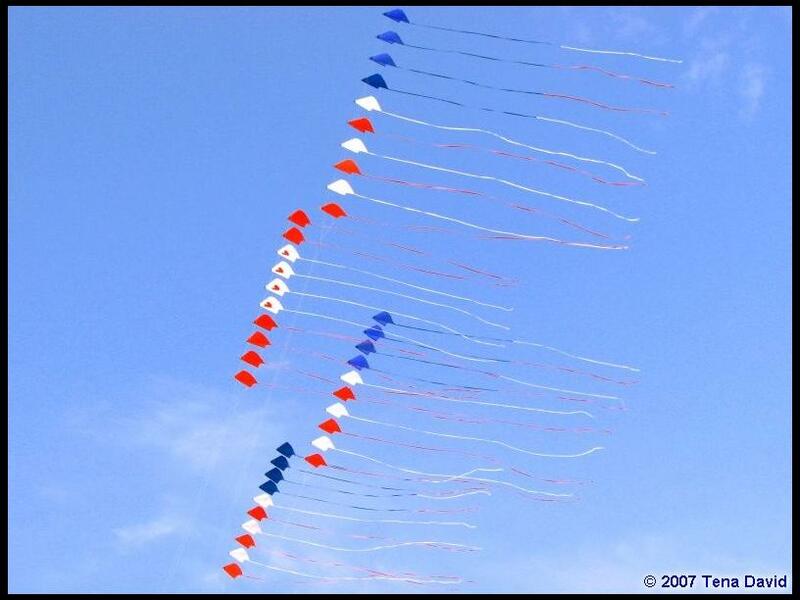 We have learned to determine the arrival of springtime by checking the calendar for the Great Lakes Kite Fest. It happens every year, the weekend BEFORE the Memorial Day holiday weekend. This is one of the things that we all have come to count on. 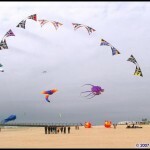 The “world’s largest kite store” is set up on the beach under a huge tent. Campers reserve spots months in advance. The shores of Lake Michigan fill with ripstop and sticks. We even open the borders and allow Canadians to bring their toys. 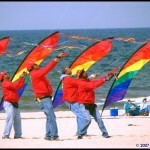 The Windjammers Kite Team pretty much defines “stacks and tails”. 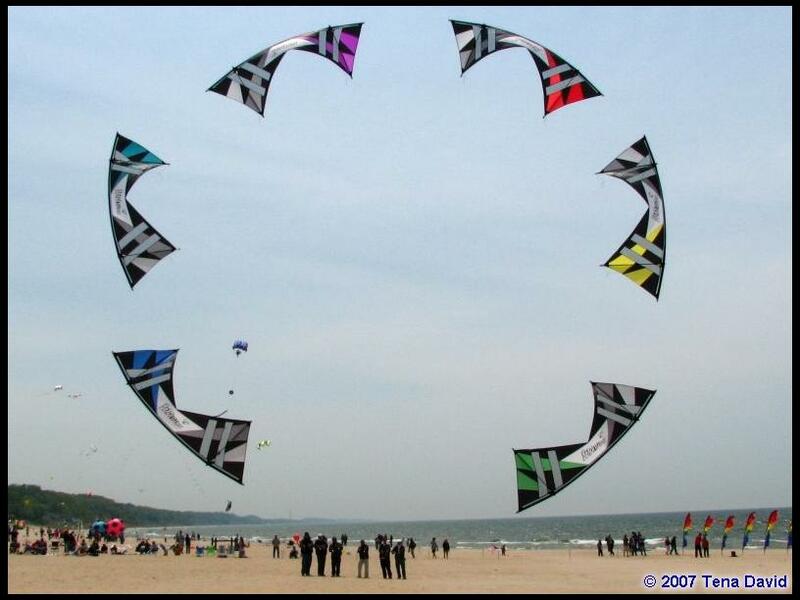 The Chicago Fire Kite Team has always demonstrated that “show tunes” are not reserved for High School Talent Shows. A pair of Revolution quad-line fliers brings out their stacks. Sam Ritter and Lee Sedgewick make a strange pair of fliers, and throw more Revs in the air than the average kite shop sells in a year. And all of these great folks come to Grand Haven. Canadians are not the only folks that travel far to get to this gathering of the tribes. Cheese-heads from Wisconsin drive around the lake or take the ferry ride to get to the event. We also get assorted folks from the Midwest and those pesky Gombergs from Oregon. Factories send their representatives. This year a group called iQuad invaded us. 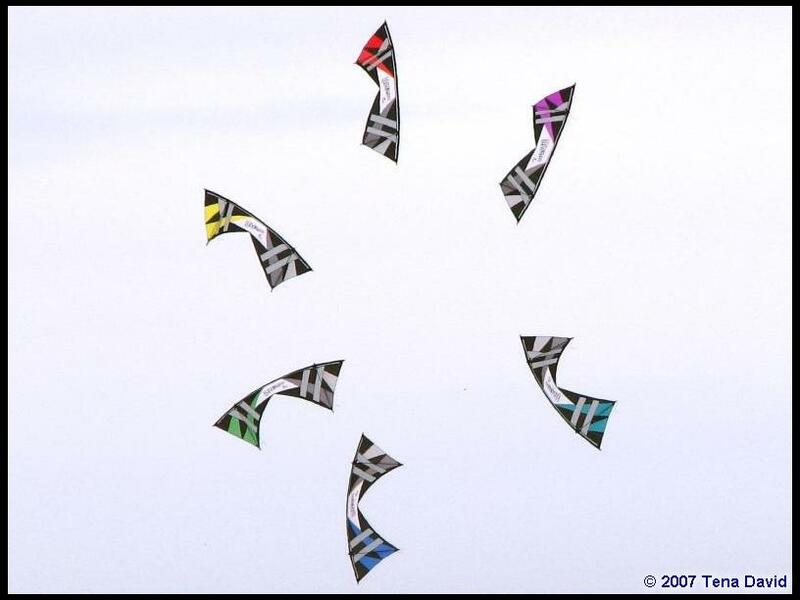 This collection of misfits thinks that quad line kites can be flown as a team, and prove it. A very unlikely duo, David “Monkey Boy” Hathaway and sometime dual-line flier, John Barresi, assembled a strange collection of Rev fliers. One of the beautiful things about dual line teams is the constant motion. One forgets that “backing in and parking” is a great visual when it incorporates geometry and color. iQuad is a group that often changes like the tides. There are different members in different US states along with a handful of members in Canada, although they have had a good solid run of the same five or six regular members for most of this season. With the help of Mike Kory’s organizational skills, iQuad has helped standardize much of Rev team flying by releasing all of their formations and maneuvers in the Rev Team Manual, available on Revolution’s web site as a free download. This has made it easy for new fliers to join in the fun at each town they visit. Talk about joining the circus when it comes to town! For more information about joining Rev mega flies at events around the country, or for more information about Rev team flying, be sure to visit iQuad’s web site. 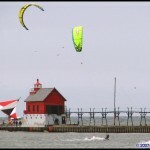 Mackinaw Kites has always had an Indoor Fly for at least the last 10 years. This event takes place in a Junior High School gym. This does not surprise the local citizens, as it did in the infancy of this event. They seem to accept crazy people walking slowly backwards, keeping mylar, nylon and poly floating through the air. This year, IQuad flew a team routine for indoor entertainment. It is so refreshing to see a touring unit of American Team Quad fliers that have incorporated Indoor routines into their shows. Grand Haven was very impressed with the three man routine that they performed Indoors. A gym floor can get crowded and the quality of the routine is a great testimony to how well these guys fly as a team. The Chicago Fire did some great demo flying with their new “probie” Zach Gordon. As has been their practice in the past, “The Fire” will be hazing young Zach for the balance of the season. Their harassment of the newest member started with his older brother Josh, when he joined the team. It has nothing to do with the quality of flying skills of the newest member, merely the fact that he has less facial hair than everyone else on the team…. except Kathy Brinnehl. Kathy did some fine demo work with her fiancé and pairs partner, Paul Koepke. We are wondering what news will be announced at this year’s AKA Nationals, as Paul popped the question last fall, and Zach was added at Des Moines. The Chicago Fire has a flair for showmanship…and have I mentioned Show Tunes? 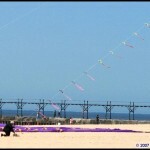 Kitesurfing is something that I admire from shore. And there are several great practitioners of the sport that use the beach as a base. 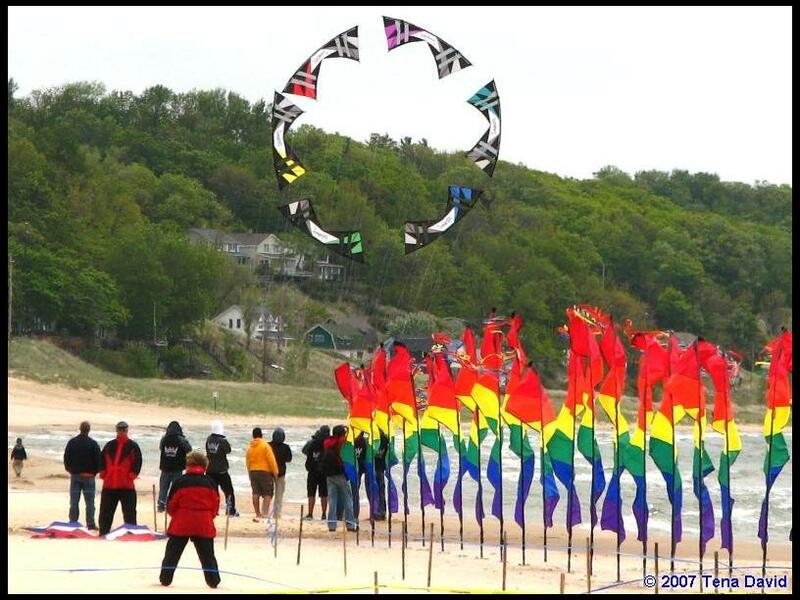 Mackinaw Kites has promoted the sport well over the years, All of the color, class and excitement make most of us geeks that stare into the sky seem a little cooler to the average tourist. Most do not know that only a handful of kitefliers are qualified to stay above the surface of the water. The rest of us Non-Tractioned landlubbers are just as impressed with the “air” beneath the board. 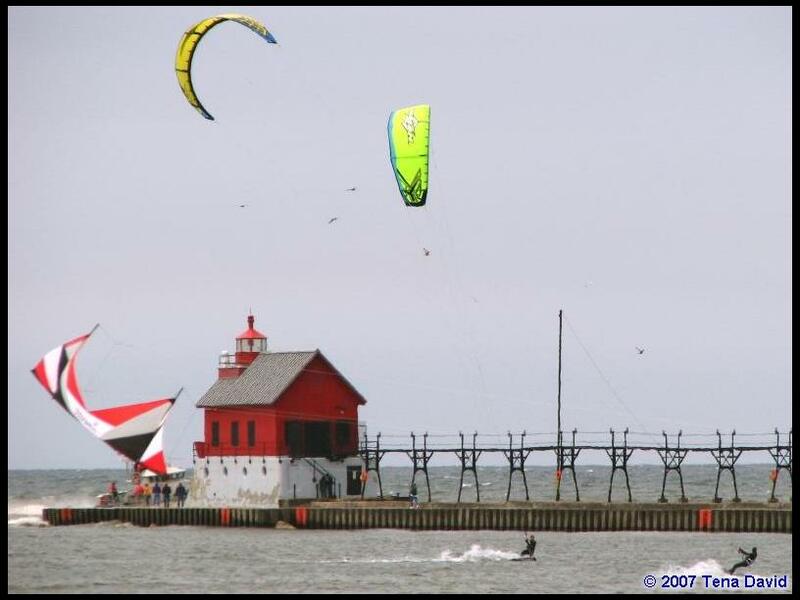 Grand Haven has not hosted sport kite competitions in quite a few years, and normally this would mean less teams, and less pairs in attendance. Team flying is still a big draw to this Lake Michigan event. 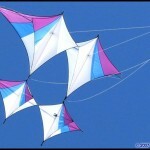 The competitions that do count are the Fighter kites. The Bandana Gang is pretty much the driving “trouble-makers” that keep fighters in the air, fliers in their circles, and pari-mutuel wagering to a minimum. NO BETTING or alcohol is allowed in the Michigan State Parks! 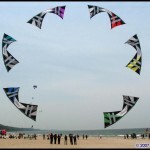 The Mid-west has a strong contingent of fighter kite fliers. “Line-touch” and “Skills” events separate the Experienced from the Novice and offer the opportunity to improve and of course…. MOVE UP! The passion that folks like Tom Braley have brought to organizing the fighters like he did with dual lines in the 90s is greatly appreciated. And Tom is not the only driving force. 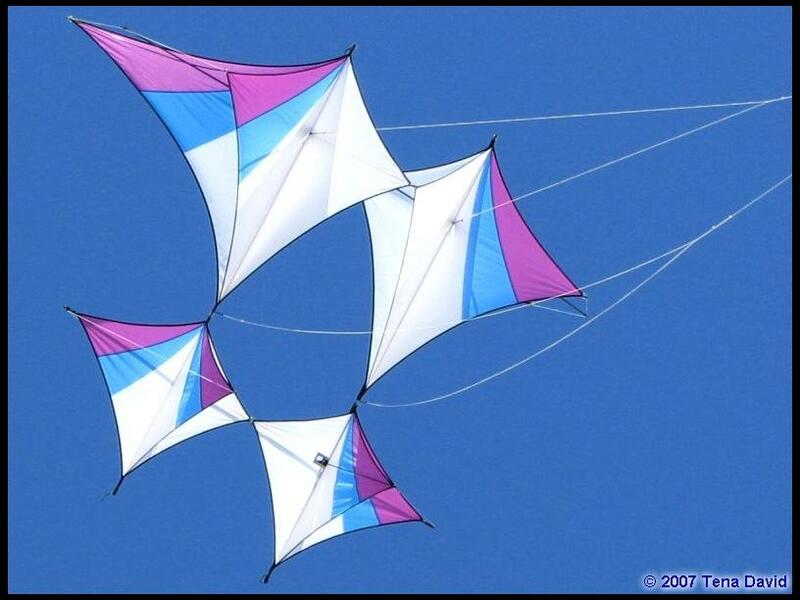 There are so many kite builders in attendance. Lam Hoac, Jon Trennepohl, Walt Park, and our own Terry McPherson attended. 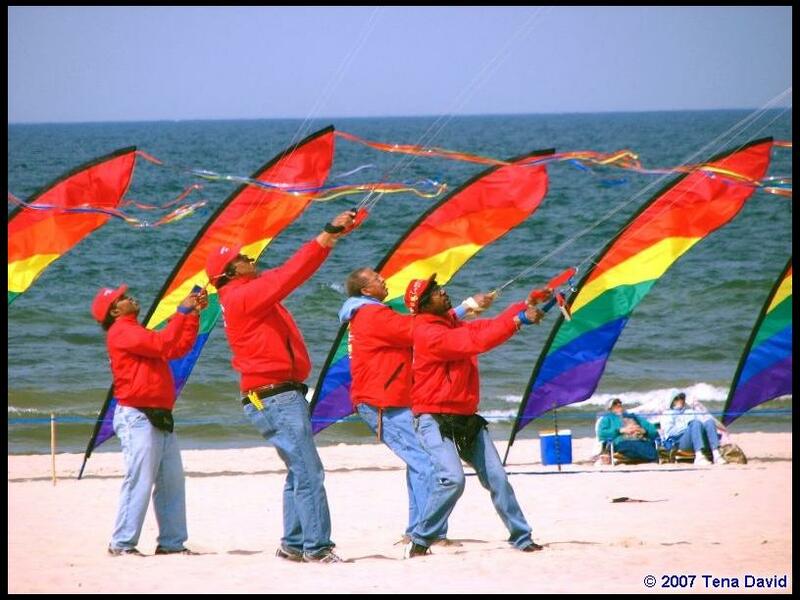 These are just a few of the great kite makers that came to show off their skills with construction and flying. I mention these folks, as I proudly own toys from most of them. 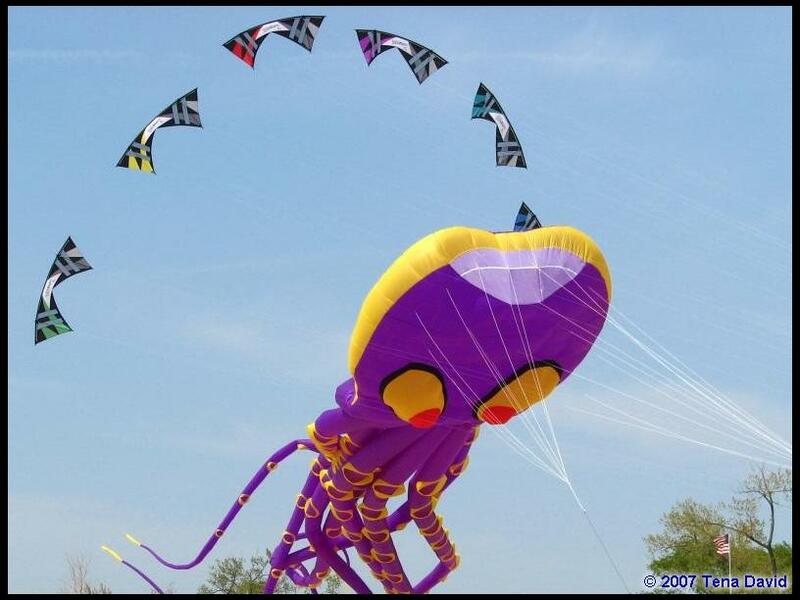 Terry, a major force in the fighter kite organization, made the front page of this year’s Grand Haven Tribune for the Saturday morning edition. Historically, anyone lucky enough to get a little wind on Friday afternoon gets that photo, but this year’s weather and turnout gave the editor a lot of choices. 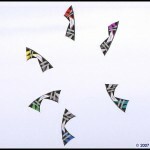 Terry had a train of eddies with oriental graphics on them. Friday afternoon was good flying. 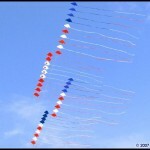 It was a beautiful spring day with enough wind to keep toys aloft. Saturday offered another nice opportunity to enjoy the Lake Michigan breezes on an excellent sunny beach. 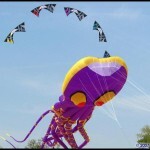 Saturday night offered enough wind to get some kites in the air for a “Night Fly”. iQuad showed some nice movement of light on the darkened sands. The night was nice enough that some of us had to be “encouraged” by park officials to find our cars, as they were locking up to go home. 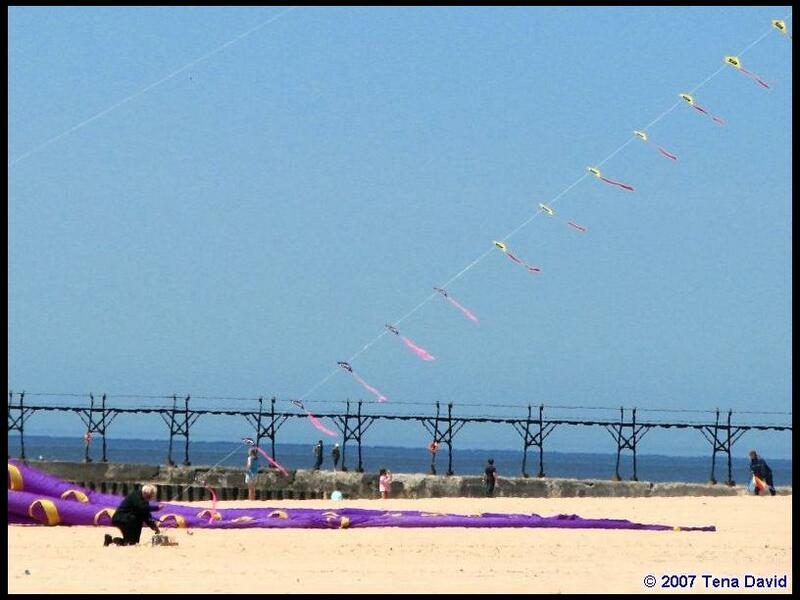 Someone once said “if you wanted to sleep, you shouldn’t have come to a kite festival.” This year, Sunday was still sunny with enough wind to get many of my toys back in the sky over the sands and sun-worshippers in this great little resort community. 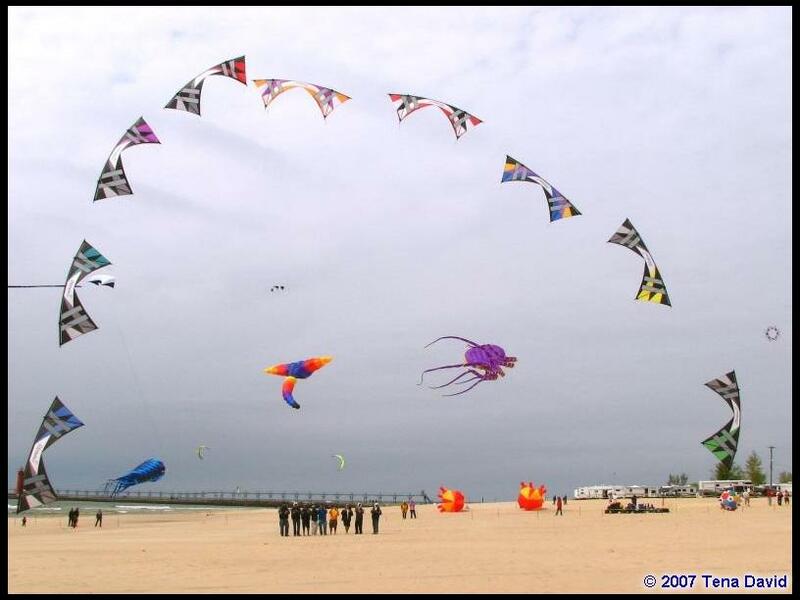 As Steve Negen put it in a conversation after the event, “Sometimes ya get lucky.” The kites are an important part of this event, but the greatest memories always involve the wonderful people that are pulling the strings. 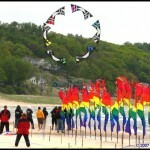 This entry was posted in 2007, Issue 55 (Jul/Aug), KL Archive and tagged festival, great lakes, kite surfing, windjammers.